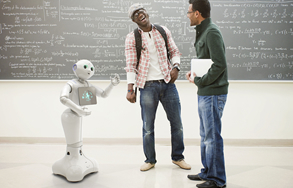 Emotion Robotics, is a solutions specialist within the social robotics field, providing solutions for both business and education. Part of our challenge is to review emerging technologies and their application to real world requirements. 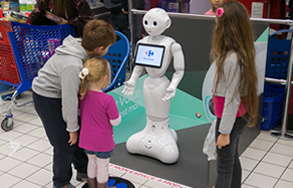 The Pepper and Nao robots, from SoftBank Robotics Europe, represent the leading edge technology for social robotics. We are seeing these tools used, not only in business but to help children with autism, reassure children when having medical procedures, assist in the education about diabetes, and even working with the elderly suffering from dementia. Emotion Robotics' focus is on finding and developing new and innovative solutions in the emerging field of social robotics and bringing technology into businesses and service areas. We also appreciate that we can't be experts in every field, so we actively seek and work with professionals from a wide variety of fields to build world leading solutions. 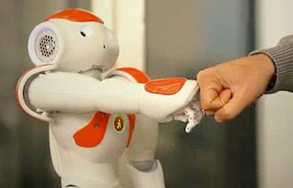 Late in 2010, Carl Clement, a founder at Emotion Robotics Limited, became involved in the Aldebaran Nao developer Program. The program was an opportunity for developers with experience in robotics to get access to the Nao robot platform and help move it to a commercial product. Carl's experiences lead him to develop a simple game for his nephew. Once the game was released, he was approached and asked if it could be used by researchers investigating the use of social robotics to help children with autism. Intrigued by this, Carl became involved in developing robotic applications to assist children with autism and learning difficulties and many of his applications can be found in the Aldebaran Assist Kids with Robots solution. The natural continuation of this work was to create Emotion Robotics, providing a platform for him to focus on both robot applications in business and continue developing assistive applications. Carl has spoken on the subject of social robotics on a wide range of occasions, from corporate events to the Royal Institution, healthcare events to schools and guest lecturing at Beijing University. Should you have a requirement for a speaker on social robotics, please contact us via our contact us page and we will be happy to discuss your requirements. Carl's TEDxCanary Wharf talk is available on YouTube here.